59% of US broadband households subscribe to Netflix, Amazon, or Hulu., according to Parks Associates. The firm’s OTT Video Market Tracker service notes that 6% of US broadband households subscribe to a service other than one of the top three, while 3% subscribe to one or more sports OTT video service, including MLB.TV, NFL Game Pass, NBA League Pass, or WWE Network. The OTT Video Market Tracker ongoing service provides industry research data and analysis of competing players’ strengths and weaknesses in the space and includes an exhaustive analysis of market trends and profiles of over 100 OTT video service providers in the US and Canada. “US consumers are not taking solely a Netflix, Amazon, or Hulu subscription. Many are shopping around and trialing new services to get access to interesting content unavailable through the big services,” said Brett Sappington, senior director of research, Parks Associates. Parks Associates notes that Crunchyroll and WWE Network are examples of niche services that have grown strong customer bases while remaining unique from industry giants such as Netflix, Amazon, and Hulu. Crunchyroll reported more than one million global subscribers as of February 2017, while WWE Network had 1.95 million global subscribers following WrestleMania 33 in April. “Crunchyroll is a great example of a niche OTT video service that understands effective niche-oriented competition,” Sappington said. 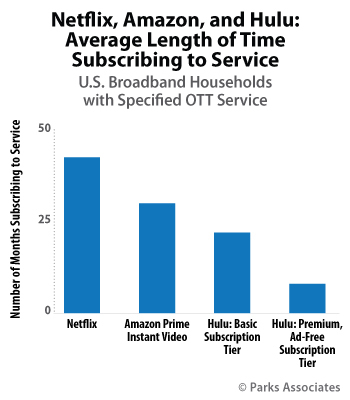 According to the OTT Video Market Tracker, 65% of US broadband households subscribe to at least one OTT video service. However, the firm notes that household penetration is slowing and that growth areas are in multi-subscription households and older consumers adopting services. “One-third of broadband households subscribe to multiple OTT services,” said Glenn Hower, senior analyst, Parks Associates.